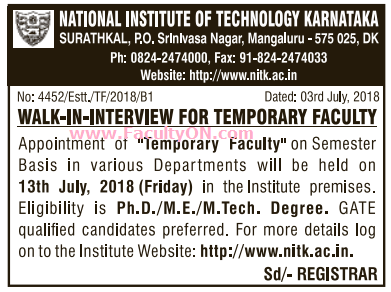 National Institute of Technology Karnataka has advertised in the DECCAN HERALD newspaper for the recruitment of Temporary Faculty jobs vacancies. Interested and eligible job aspirants are requested to walk-in on 13th July 2018. Check out further more details below. College Profile: National Institute of Technology, Karnataka, formerly known as Karnataka Regional Engineering College, also known as NIT Surathkal, is a public engineering university at Surathkal, Mangalore. Qualifications: Ph.D / M.E / M.Tech. GATE preferred. How to Apply: Candidates are requested to appear for Walk-in interview along with filled application form along with all self attested documents viz. Certificate/ Mark sheet/ Testimonials to the address provided below.